This is a listing of sites on the care and preservation of items relating to kitchenware. A few of the sites give contradictory suggestions. I do not endose any particular site, and at times it is safer to check with an expert before working on an antique. Winterthur offered an interesting day long seminar: "Caring for your family treasures" [fabric, books/papers, photographs and silver], which included tours of their various storage areas. "Caring for your collections" was held at Mount Clare Museum in Baltimore the following summer. On Feb. 4, 2006 Winterthur will hold a one day session on "Taking Care of Your Family Treasures". 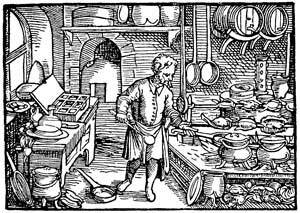 The picture is from the Medieval/Renaissance Food Clip-Art Collection by Cindy Renfrow.